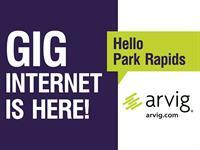 Park Rapids: Gig internet is here! Local news, sports and more! *Based on Arvig service area, some restrictions apply.